In twinkling spring sunshine, Taoiseach Leo Varadkar and Minister for Transport Shane Ross jointly performed the official sod-turning for Dublin Airport’s €320m North Runway project. The new 3.1km runway will take two years to construct and a nine-month period of commissioning will then take place before its opening for Christmas 2021. Dublin Airport authority is seeking changes in planning permission which will enable full use of the runway between 11pm and 7am to apply once the new runway is built. Legislation to establish a new independent aircraft noise regulator at Dublin Airport is currently going through the Oireachtas. The views of daa, local communities and other stakeholders will be taken into consideration, and the regulator will make its decision based on an EU framework for assessing noise at airports. Dublin Airport CEO Dalton Phillips said: “It has never been Dublin Airport’s intention to have lots more flights in the middle of the night, but the new conditions would have a very significant impact on the business, as 6am-7am is the airport’s busiest time of the day. DAA works closely with airlines, the Irish Aviation Authority and ground handling firms to minimise aircraft noise at Dublin Airport and is also introducing a series of mitigation measures in relation to noise. DAA is insulating about 200 homes near the airport to the highest standards and has also set up a voluntary scheme to buy up to 38 properties that are most affected by the North Runway development. InterVISTAS , analysts employed by DAA in September 2017 claimed north Runway will support the creation of 31,200 new Irish jobs and €2.2bn in additional economic activity by 2043. A written press release said: The contract includes building 306,000sq m of new runway and taxiways, 6km of new internal airport roads, and two new electricity substations. New drainage and pollution controls will be installed, as well as about 8km of electrical cable, 11km of CCTV cable and more than 2,100 new runway and taxiway lights. 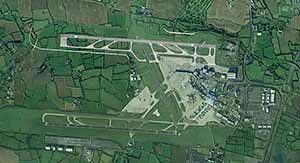 The project, located 1.7km north of Dublin Airport’s current main runway, t will be funded through a combination of DAA’s own revenues and borrowings. DAA says it is a significant contributor to the Irish Exchequer, having paid €85 million in dividends and €347 million in taxes since 2014 Separately, DAA is planning a new five-year investment programme for Dublin Airport. It includes a €900 million investment in new boarding gate areas, aircraft parking stands and other improvements alongside about €200 million worth of airfield works and a €120 million annual spend on repair and maintenance and revenue generating projects.North Runway is being built by a joint venture comprising Irish construction company Roadbridge and the Spanish infrastructure group FCC Construcción (FCC). Roadbridge FCC won the main construction contract last October, following an international tender process.300 construction workers will be employed onsite and hundreds of jobs will also be created by related activities offsite. Roadbridge FCC will be working closely with DAA and Fingal-based development company Empower to fill as many positions as possible from within the local community.